Jews sans frontieres: Hey AIPAC, why the long face? AIPAC welcomes the resumption of direct talks between Israelis and Palestinians. AIPAC has been supportive of Secretary Kerry’s efforts to achieve direct bilateral talks, and we commend his determined hard work and commitment. We hope that these discussions will lead to successful negotiations. It’s not on AIPAC’s front page. Nor is it on the peace process page. It is on its press page, which can be accessed from a link at the top of the organization’s home page. I found out about the link, dated July 19, when I asked AIPAC on Tuesday for a statement on the renewed talks. The statement seems never to have been emailed to reporters or to congressional staffers, although other major Jewish groups published endorsements of the renewed talks, and AIPAC routinely emails its press releases. I’ve received every one on this page except for the peace talks endorsement. I’ve confirmed the non-receipt with six other people, both on the Hill and in the media. A source close to AIPAC insists to me that the statement was widely emailed. To be clear, AIPAC has strongly endorsed the renewed talks behind closed doors. This June 26 story about an off-the-record meeting with Democrats in the Senate, took place before the July 19 renewal of the talks, but well into Kerry’s efforts to get them started. At that point, the hearty endorsement conveyed by AIPAC was even more critical. Which begs the question of why its July 19 statement is ostensibly only released upon request. And what's for AIPAC not to like about Kerry? The plan is that with the Arab states in complete disarray, Morsi out of the way in Egypt and Hamas severely weakened by the deposing of Morsi, Abbas will give Israel everything it wants. Ok he has no legitimacy but then nor does Israel. But the last thing AIPAC wants to do is spoil things by going all triumphalistic and it can't really feign complaint lest the more amateurish groups in the lobby misread the signals. 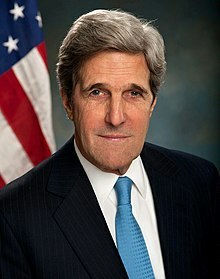 So AIPAC likes the long face of Kerry but doesn't want to shout about it.